Lehigh County Soldiers and Sailors Monument, Allentown (public domain). Inscription: One Flag • One Country. This column commemorates the valor and patriotism of the soldiers and sailors of the County of Lehigh in the War of 1861-65. Hewn from medium shade, Barre, Vermont granite and copper, then ornamented with bronze castings before being topped by the Goddess of Liberty, the Lehigh County Soldiers and Sailors Monument towers over the heart of Allentown, Pennsylvania from 99 feet above the city’s Center Square at Hamilton and 7th Streets. It was intended by its makers to inspire awe – and it does with its imposing form and its message of hope – that, no matter how greatly divided a nation may be, it will always be possible for its citizens to come together again when they appreciate both their shared humanity and the guiding principles upon which their Republic stands. 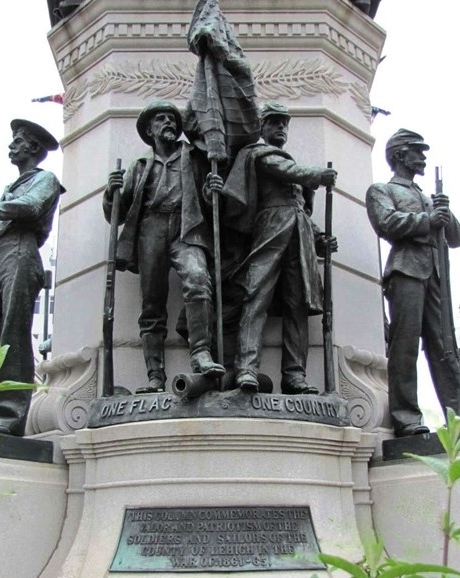 Originally erected to honor the 47th Pennsylvania Volunteers and other men who served during America’s Civil War, this monument’s cornerstone was placed at Allentown’s Center Square on 26 June 1899. The moment was commemorated by members of the Grand Army of the Republic (G.A.R. ), and had followed a two-year process of planning and approval for the monument. Ten designs were considered; its total cost when the entire monument was formally dedicated on 19 October 1899 was $43,000. Many thousands of dollars have been spent on maintenance and restorations since that time. Lehigh Valley militia units at the dedication of Allentown’s Soldiers and Sailors Monument, 19 October 1899 (public domain; double click to enlarge image). The Lehigh County Soldiers and Sailors Monument was formally dedicated on 19 October 1899, the 35th anniversary of the Battle of Cedar Creek, Virginia, one of the major engagements in which the 47th Pennsylvania Volunteers fought valiantly. The Lehigh Valley fielded five of the regiment’s ten companies, and was home to the regiment’s founder, Colonel Tilghman H. Good, who later became a three-time mayor of Allentown. Dedication Day was unlike any other seen by Allentonians that year and for many decades to come. Schools were closed to enable children to witness what was a genuine spectacle for the ages. Newspaper accounts reported that a line of anywhere between 8,000 to 15,000 marchers stretched for two miles, and that a group of daughters and granddaughters of Civil War veterans assisted with the monument’s unveiling while somewhere between 1,000 to 1,700 students from the local elementary schools sang America’s National Anthem. 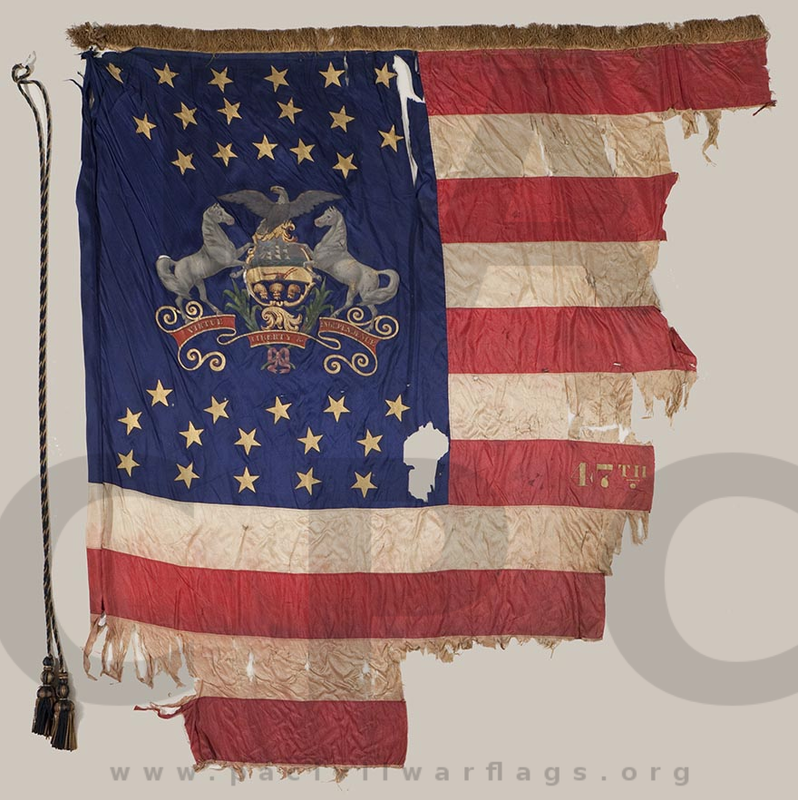 The color-bearer from the 47th Pennsylvania Volunteers, a regiment which had timed its 27th annual reunion to coincide with the monument’s dedication events, marched proudly with the same American flag carried into battle by the regiment when it had defended the nation’s capital (1861 and 1865) and bled in South Carolina (1862), Louisiana (1864) and in the Battle of Cedar Creek (1864). And all of it was witnessed by a massive crowd. In its coverage of the event the next day, The Allentown Leader estimated that it was “thought that not less than 40,000 strangers visited the city during the day, and all were cared for in a hospitable manner.” With an estimated 2,500 dignitaries and guests present on the reviewing that, the Leader noted that total crowd estimates ranged “from 20,000 to 60,000” with roughly 15,000 people “massed on the Square” for the actual monument dedication. E. B. Young Post No. 87: Francis Daeufer, Elias Gerberich, Medal of Honor winner Ignatz Gresser, Lewis E. Juergens, John N. Kline, Colonel Samuel D. Lehr, Augustus W. Mennig, Benedict Nuding, and Captain Levi Smoyer. Yeager Post No. 13: William F. Baker, George H. Lilly, Hugh McLaughlin, Abandon S. Moyer, John J. Nagle, David Pfaff, William J. Reichard, Captain Benjamin C. Roth, and Emanuel R. Shelling. Head of column at Fifth and Hamilton. Up Hamilton to Seventh, Seventh to Linden, Linden to Eighth, Eighth to Hamilton, Hamilton to Sixteenth countermarch in review to Fifth and dismiss. A reviewing stand was erected for participating dignitaries, ceremony participants and their guests at the northeast section of Allentown’s Center Square. Hotels, Masonic and veterans’ lodges, fire and police stations, and other local facilities were converted into assembly and refreshment areas for the parade’s numerous divisions of marchers who came from across Pennsylvania. Following a stirring parade, Pennsylvania Governor William Alexis Stone, former U.S. Congressman Constantine Jacob Erdman and Reading Company president George Frederick Baer were among the orators who tugged at the heartstrings of the crowd of thousands. 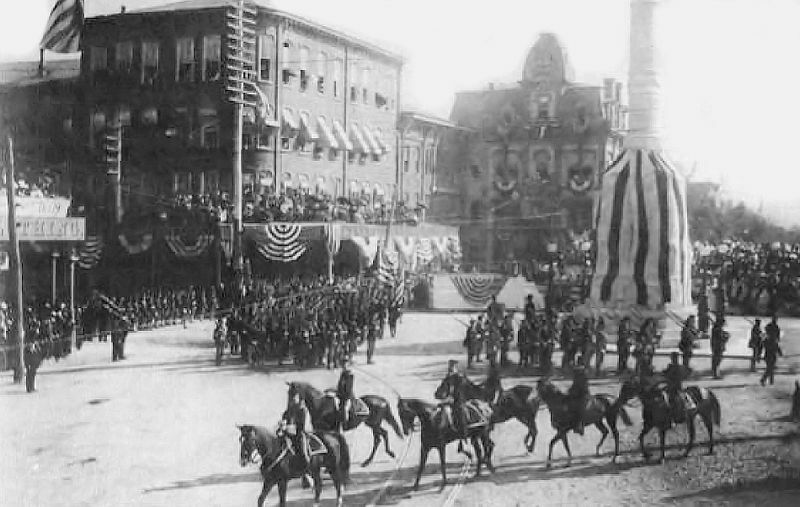 The parade, which began at just after 12:30 p.m. on 19 October 1899, was reported by The Allentown Leader to be “the largest and grandest demonstration in the history of the city” with 125 organizations “in line, representing the principal towns and cities in the eastern section of the state.” Corporal Daeufer served as the parade’s chief marshal, and ensured that each of the parade’s divisions (Grand Army of the Republic, Union Veteran Legion, Sons of Veterans, Patriotic Order Sons of America, Knights of the Golden Eagle, Junior Order United American Mechanics, Improved Order of Red Men, fire department, Survivors of the Forty-seventh Regiment, Soldiers and Sailors of the Spanish-American War, Knights of Pythias, Knights of Friendship, Knights of the Mystic Chain, National Guard of Pennsylvania, and various other organizations) stepped off on time and kept the parade flowing with energy and efficiency. Just after noon on the 19 October, the General Committee greeted the arriving train of Governor Stone and his staff: Private Secretary Gerwig, Colonel Pratt (New Milford), Colonel Seitzer (Lebanon), Colonel Shoemaker (Philadelphia), Major Richard, and Colonel Sweeney (Chester). The committee members then escorted Stone and his staff to the Allen Hotel to connect with gubernatorial staffers, Adjutant General Thomas Stewart and Colonel Trexler, before heading off to their positions in the parade. The parade … was by all odds the biggest the town has ever seen. It moved like clock work, and it was only 10 minutes after the appointed time when it left the starting point. There was a very formidable advance guard, including Chief McGee and his entire police force, two of whom, Officers Bailer and Constanzer, were mounted, and right behind was a platoon of cavalry…. The first division was very successfully started off by Marshal V. H. Wieand and his two aids, Harry Smith and Robert Fatzinger…. Prominent in the carriages were Governor Stone and his staff, Dr. Baer, the orator, Colonel Shaw, Mayor Schaadt, the members of Councils, the Reception Committee, the General Committee and Board of Control. The colonel had a beautiful black charger, and with him was his full staff. The regiment looked very impressive as company after company marched up the street, 23 to 27 men abreast, from curb to curb. Col. O’Neill, Major Earnest, Major Mickley, Captain Eckman, the latter three commanding the battalions, were very frequently applauded. The soldiers marched with a great deal of dash, and showed up magnificently when they struck the governor’s blue flag at the reviewing stand. Close behind were the survivors of the Forty-seventh Regiment, men who fought so gallantly on this day 34 years ago at Cedar Creek. The Union Veteran League made an appearance of which its national commander, Col. William R. Wooters of Philadelphia, who was on the grand stand, was very proud. The Grand Army gave the position of honor to the E. D. Baker Post of Philadelphia, which was headed by our own Col. Birkenstock, who is a member. The music for this post was furnished by Frankenfield’s West Philadelphia Band. Other veterans in this division were Yeager and Young Posts of Allentown, Taylor of Bethlehem, Oldham of South Bethlehem, Lafayette of Easton, Kress of Slatington, Hermany of Stinesville, Chapman of Mauch Chunk, Bertolette of Lehighton, and Fuller of Catasauqua. Right behind them was a delegation of Spanish War veterans under Capt. Fried, who wore the uniforms they had when fighting the Spaniards last year. The Pioneer Band furnished the music for Young Post. The big Sons of Veterans division, headed by Marshal Hutchinson, made almost as fine an appearance as the National Guard. At the right of the line was the First Regiment of Philadelphia with the Athletic Band of Reading. Included in this division was Allen Camp of Allentown, Meade Camp of Reading, Good Camp of Emaus, and large delegations from Philadelphia, Stroudsburg, the Bethlehems, Slatington and Easton. The Red Men made a great showing. Every one of the 500 Indians in line was costumed, and Big Chief E. L. Newhard was marshal. About 50 of them were on horseback. These were followed by a float representing Penn’s Treaty by Red Hawk Tribe of Allentown, squaws in a tally-ho, a float with tepees by Minsi Tribe of Coplay, a float representing the Boston Tea Party, and then came a big delegation of Indians on the trail. No attempt was made by these at marching. There were Indians with red whiskers, Indians with mustaches, and much fat Indians, and lean Indians, and tall Indians, and Indians with russet shoes, and Indians with patent leather shoes, carrying war clubs, hatchets, knives, and tom toms. * Note: Not genuine Native Americans, these men were members of their respective communities’ chapters of the Improved Order of Red Men. Marshal C. P. Clauser marched at the head of as fine a division as was seen in the parade. The commanderies looked very bright with their plumes, baldrics and swords. Included in the division was a delegation with red, white and blue umbrellas and the Continental Drum Corps. The Emaus Band furnished the music. The Junior Mechanics division was also very large, and all the councils marched superbly…. The Knights of Friendship, especially Lehigh Consultory, looked exceedingly well in plumes, Prince Albert coats and purple baldrics. Milford Lodge of the Knights of Pythias of Limeport sent a very large delegation. Dr. J. D. Erdman rode at the head of a very fine turn-out of Knights of the Mystic Chain. He saluted the governor like an old military man, as did all who were with him. The Knights of the Golden Eagle made a very proud showing. Marshal F. P. Hunsicker and Col. A. S. Rabenold looked splendid on horseback. The state officers in carriages saluted the governor in the most approved style. Catasauqua Castle drilled with very pretty effect. The rear was brought up by delegations from a large number of castles massed to make a big showing. The Golden Eagles, as well as the Knights of the Mystic Chain, was followed by floats containing degree teams. The Lehigh Saengerbund and Turner and Liederkranz turned out to a man, and the Sixth Ward did its full share in making the parade a success by sending the Emerald Association, Ancient Order of Hibernians and Temperance Society. The familiar march music of the Allentown Band announced the passing of the entire fire department, headed by Chief John V. Huffort. Every company had donned its finest uniforms. They marched like regulars, and the firemen of Allentown never made a prouder showing. The parade was so big that when the fireman got to the Square after marching in Seventh Street they met the head of the parade, which was already down Hamilton from Sixteenth Street. It is estimated that 8000 men were in line. Lawrence Gilbert, son of Mr. and Mrs. W. J. Gilbert of the Pennsylvania Hotel, who is the youngest uniformed fireman in Allentown, marched at his accustomed place with the leaders of the Rescue Hook and Ladder Co.
Lehigh Castle No. 272, K.G.E., was in the parade, though not on the official program. The Athletic Band of Reading was entertained by the Liberty Fire Co. The Keystone Athletic Association entertained the Fourth Regiment Drum Corps. The police preserved excellent order. The roping of the streets enabled the paraders to arrange themselves in the most showy style. It was a quarter after 3 when the eight little girls, granddaughters of veterans, arrived at the monument to pull the string that would unveil the heroic bronzes ornamenting the shaft. These children, in whose lives yesterday will ever be a red letter day, were: Ruth Shelling … Althea Kline … Edna Holman … Salome Helfrich … Lulu [Schneck] … Fannie M. Walters … and Hannah [Young]…. They wore white gowns, elaborately trimmed with national colors, caps made out of flags, and carried little silk flags…. By this time there was an immense crowd on Centre Square, every inch of space being occupied. It was literally a sea of heads. They were massed around the monument, whence they radiated in every direction far up and down the streets. Every balcony was crowded and every window contained as many heads as it would hold. The Allen balconies and windows were extensively patronized. Even the roofs were crowded and some of the more venturesome boys were on the chimneys. Ex-Congressman Erdman, as chairman of the unveiling ceremonies, acting as the representative of the county commissioners, gave Klingler the signal, and the Allentown Band broke out into an ‘American Fantasie,’ which consisted of snatches from ‘Yankee Doodle,’ ‘Star Spangled Banner,’ ‘Old Kentucky Home,’ and other popular American airs. The eight little girls pulled the unveiling string, and then, from the four wings of the eagles standing at the foot of the plinth, fell the flags that had veiled the monument, revealing the matchless figures in bronze that lend such a charm to the column. A tremendous cheer arose from the vast crowd, and veterans waved their caps and shouted. The next was the star effort of the day, the great formal oration by Geo. F. Baer of Reading. If ever an oration fitted an occasion this one did. The matter was superb, and the manner of delivery an inspiration. Strong in voice and forcible in everything, Dr. Baer’s clear tones commanded attention silenced the crowd. He spoke with excellent effect and all his climaxes were applauded. Following Baer’s powerful address, the national commander of the Grand Army of the Republic, Colonel Albert D. Shaw of Watertown, New York, also delivered remarks, as did Adjutant General Thomas Stewart. The Leader observed that General Stewart’s remarks “thrilled” the crowd. The Lehigh Saengerbund (choral society) and Allentown Band then closed out the program with the choir performing, Das Ist der Tag des Herrn! (This Is the Day of the Lord!). The 13-foot-tall statue was supposed to be a replica of the original iron statue that stood atop the monument’s granite column from 1899 to 1957. But this Goddess looked different. Her head was bigger, at least twice as large as the one on the old corroded statue…. As the statue’s 50th anniversary approached last week, a local expert on monuments offered a possible explanation for the statue’s metamorphosis: A sculptor changed the mold to look like a relative. ‘A lot of times, carvers and sculptors of public monuments will add features of their relatives, whether it be their children or their wives or their sisters or their mothers,’ said the expert, who did not want to be identified for fear of appearing critical of a competitor…. The theory may be impossible to test. Viggo Rambusch, whose Manhattan monuments company took the old statue in 1964 to produce the new mold, said he doubts the sculptor altered the face for any personal reason…. Rambusch identified the 1964 sculptor as Dominic Facci of New York City. But clues to Facci’s intentions are not likely to turn up at this late date. Facci died in 1994….. The fact that the monument is still in place after more than a century is, perhaps, the most important take away point in all of the many narratives written about it over the years. Proudly raised by Civil War veterans in honor of their comrades who fell in battle and lovingly maintained by community members who grew up appreciating the sacrifices those men made, Allentown’s Soldiers and Sailors Monument stands as a permanent reminder of the cost paid by so many to preserve the civil liberties of their fellow Americans. 1. Allentown City Walking Tour, on AllentownPA.gov. Allentown: Retrieved October 2015. 47th Reunion, in The Allentown Leader. Allentown: 13 October 1899. A Glorious Day: Yesterday’s Monument Unveiling a Great Success: Gov. Stone’s Taking Little Speech: Praise for Dr. Baer’s Oration: Colonel Shaw Grows Eloquent and General Stewart’s Windup Pleases Everybody. Monument Now in Allentown’s Care, in The Allentown Leader. Allentown: 20 October 1899. Big Parade Forms: Most Stirring Time in the History of Our Stirring Town: Fourth Regiment Marches Up Town: Col. O’Neill on a Black Charger at It’s [sic] Head. Governor Stone and His Party at the Allen. Revised List of the Little Girls Who Unveil the Monument, in The Allentown Leader. Allentown: 19 October 1899. Board of Control: Legislation for the Benefit of Allentown Schools: Monument Day Will Be a Holiday, in The Allentown Leader. Allentown: 5 October 1899. Parade a Monster: Two Miles Long and Fully 8000 Men Were in the Line: Took an Hour to Pass a Given Point: So Well Marshaled That It Got Through Before Schedule Time: Allentown Again Shows Its Ability to Arrange for a Successful Demonstration, in The Allentown Leader. Allentown: 20 October 1899. Program Adopted: Order of Exercises for Unveiling Decided Upon: Governor Stone Will Be Here, in The Allentown Leader. Allentown: 5 October 1899. Reunion of the 47th: Grand Array of the Veterans Here for the Unveiling, in The Allentown Leader. Allentown: 19 October 1899. Route of Parade: Where the Monument Marchers Can Be Seen on Parade Day: Common Sense Route Selected: Not So Long That It Will Tire the Participants. Refreshment Committee Appointed. J. Harry Lawler to Get 800 Flags. Why October 19 Was Selected, in The Allentown Leader. Allentown: 12 October 1899. The Mystery of the Goddess at Allentown’s Center Square, in The Morning Call. Allentown: 29 May 2014.